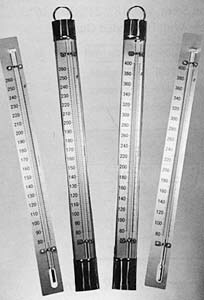 Copper Case Candy Thermometers - Philadelphia Instruments and Controls, Inc. - Specializes in the production of temperature related products. Magnifying lens front tube, red reading mercury, mounted on a silvered scales with black lines and numerals. Copper Case Thermometers comes equipped with an attached mounting bracket for attaching to side of kettle. This Thermometer is available in two different lengths. A 12" model, #420; or an 18" model, #423. When ordering, please state Thermometer size and Temperature range. Teflon ® Coating is available on the Thermometers above. Should breakage occur, the coating eliminates the chance of contamination by containing the Mercury and broken glass. Teflon ® is a registered trademark of Dupont. Send e-mail to info@philadelphiainstrument.com with questions or comments. Copyright © 1999 - 2005 Philadelphia Instruments & Controls Inc. All Rights Reserved.